Wash zucchini and cut ends off. 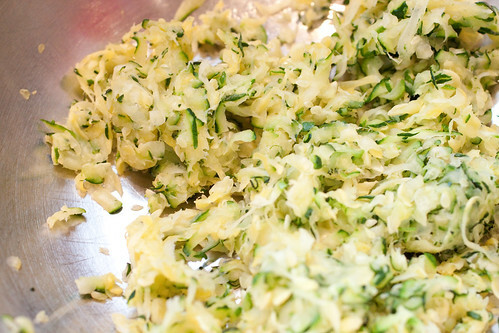 Grate the zucchini coarsely. Salt the shredded zucchini and set in colander to drain for 10 minutes. 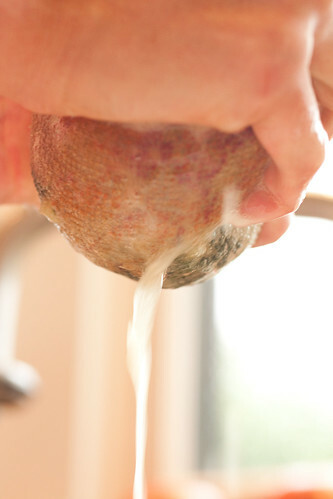 Then wrap in kitchen towel and squeeze out the water. Keep squeezing! 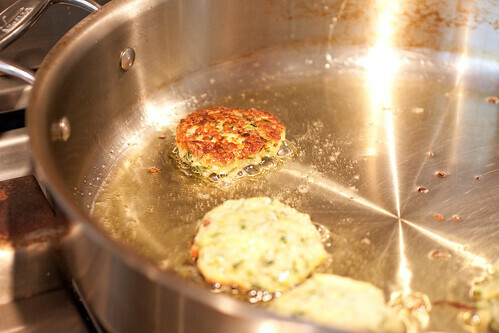 You want to remove all the excess liquid so that the critters don’t fall apart in the skillet. Dump shredded and squeeze-dried zucchini into a large bowl and add the garlic, cheese, egg, bread crumbs, herbs, salt, and pepper to taste. Mix well. 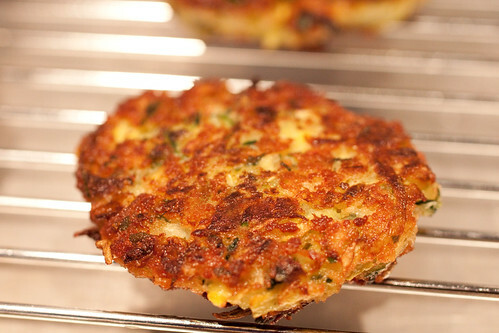 The batter should be moist – neither too wet (if so, add more bread crumbs) nor too dry (add another egg). 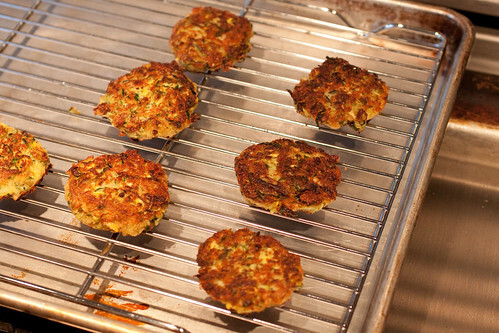 Form into small hamburger-shaped patties or “critters”. Heat olive oil in large skillet. Drop critters into hot oil and flatten slightly. Fry until golden brown and delicious. Flip and fry other side ’till GBD. Drain on wire rack set into baking sheet and sprinkle tops with a little more salt. Serve warm or at room temperature. We like ‘em plain but you can serve them with tomato sauce if you’d like. 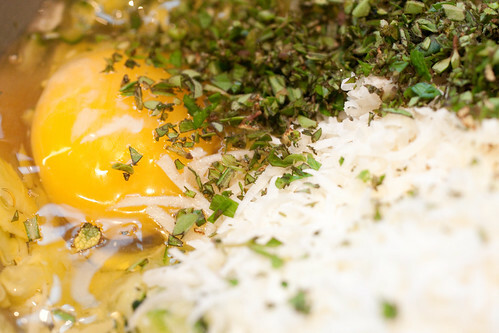 *Substitute 4 ounces crumbled feta for the cheese and dill and mint (generous tablespoon each) for the other herbs. Add sliced scallion and zest of a lemon. Serve with plain yogurt, sour cream, tzatziki sauce, or lemon wedges. *Add minced scallions, cumin, and/or red pepper flakes. *Substitute canola oil for the olive oil. 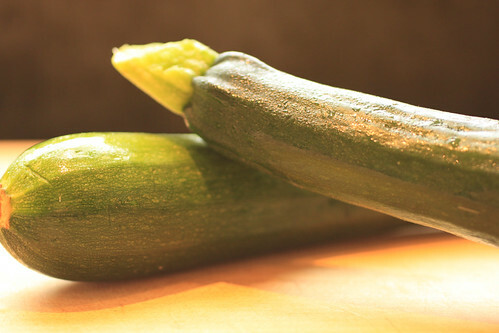 *Use squash along with the zucchini to make squacchini critters!